The twinning with the Diocese of Luweero is an iniative of the NW European Archdeaconry. A growing number of chaplaincies in The Netherlands and Belgium take part in this scheme. Representatives from the Benelux churches visit many churches and support various projects. Uganda, approximately 6.5 times the size of The Netherlands and with a population of 18 milllion, will always be associated with the reign of terror regime of Idi Amin from 1971 till 1979 and the Liberation War that ended in 1986. During those fifteen dreadful years the economy was completely destroyed, 800,000 people were killed, more than 250,000 took refuge in neighbouring countries and 1,000,000 people became homeless. Luweero a small town, about 80 km north of Kampala, will always be connected with the infamous ? Luweero Triangle ?, the area in which people suffered most from the violence of war. Between 1983 and 1986 in this area 300,000 people were slaughtered. The Church of Uganda decided to found a diocese in Luweero to provide relief for the emotionally hurt people in this particular part of the country. As you will find in the trip reports of 2000 and 2002, today there is now a relatively stable situation (except in the northern border region) but although there has been an obvious progression in development, there is a lack of anything more than basic needs. Our former bishop, The Rt. Revd. John Hind and the Revd. Canon Brian Lea, former chaplain of The Hague, developed the idea as an initiative of the NW European Archdeaconry. The Revd. John Kizza, chaplain of Ndejje University, Luweero visited HTC, Utrecht and some other congregations in the NW Europe Archdeaconry. A group of 12 (9 of them from HTC, Utrecht) led by Richard and Sue Smith, visited Luweero, Uganda to launch the Twinning Projects. The Revd. 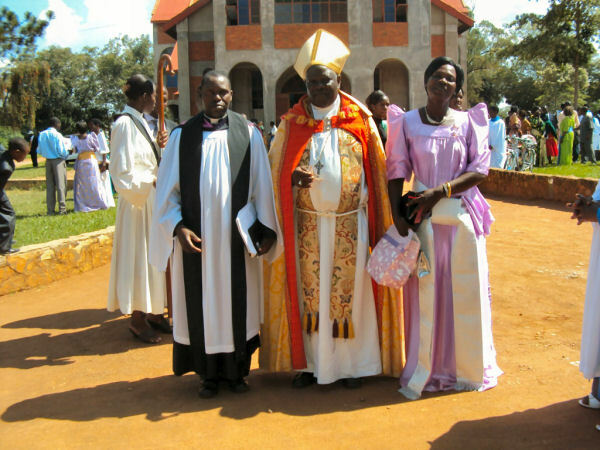 Canon Kezekia Kalule, Archdeacon of Luweero and Bp. Evans visited HTC, Utrecht and some other congregations in our Archdeaconry. A group of 19 (5 of them from HTC, Utrecht) again led by the Smiths, visited Luweero to see the running projects. 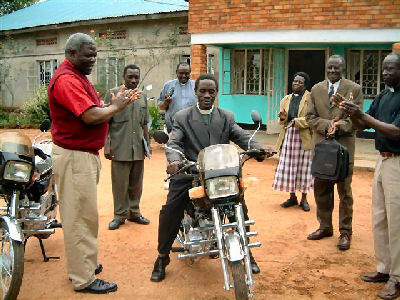 Two people of the 2002 group visited Luweero to shape and explore future projects. Following the 2004 visit two more visits were made and a new project focused on Water and Malaria was commenced. Bishop Geoffrey chose the Luweero Malaria Project as one of the goals in the Advent Appeal. Strengthen our international brothers and sisters and the fellowship of the body of Christ. Grow together in faith through sharing prayer, testimonies and experiences. Support Church ministry through individual and common resources. Stimulate our knowledge of how God cares for his people. Unite the chaplaincies across NW Europe Archdeaconry and Luweero Diocese, providing a greater sense of common purpose and identity for each. How is Holy Trinity, Utrecht involved? The Bukatira/Ssemuto dispensary was built with the help of a generous donation from an anonymous member of Holy Trintiy, Utrecht. It took about a year before the Ugandan Ministry of Health licensed it but it is now in full operation. There have been some changes in the Luweero Twinning. These changes were necessary as the nature of the activity evolved and to enable us, when required, to arrange insurance covering group visits, obtain financial support from donor organizations and where necessary enter into agreements with other organizations. As can be seen from the following explanation, the Luweero Twining is now a registered Trust or Stichting and will continue with the sort of projects it has successfully executed in the past. A second Trust or Stichting, The Healthy Vine, has been formed to handle specific long term programmes. 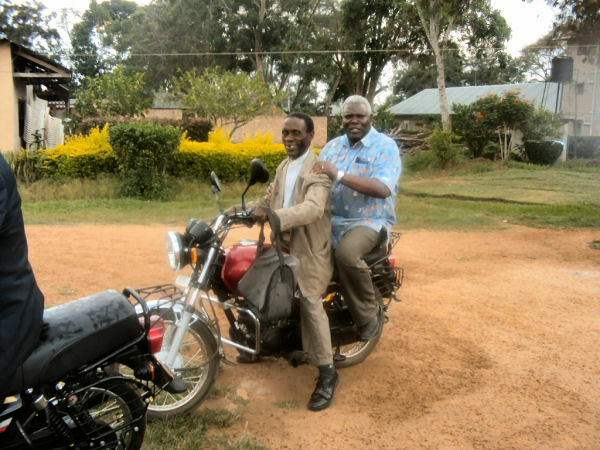 The concept for Luweero Twinning was born at the Lambeth Conference in 1998 during a discussion between Bishop John Hinds and Bishop Evans Mukasa Kisekka. Since then about 18 projects have been completed. These projects cover the very wide spectrum of the role that the Anglican Diocese of Luweero has within it diocese. The projects have been financially supported by Anglican Chaplaincies and De Oud Katholieke Kerk and individuals from these congregations. 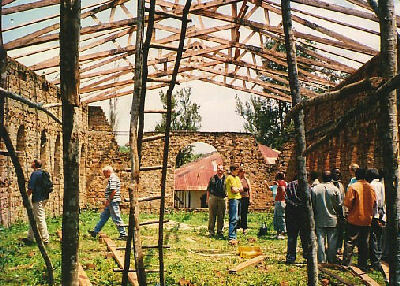 They include building and renovation of school classrooms, a herd of heifers, zero grazing heifers, brick making, supply of bicycles and motor cycles, fish farm, tools for a vocational schools, supply of religious reference books, hymn books, completion and equipping of a clinic, tree planting, assisting new church buildings, supporting a mothers union. In other words anything to assist the spiritual and day to day life of the residents in the Luweero Diocese. The projects are all short in duration and are financed solely by De Oud Katholieke Kerk in Den Haag and Chaplaincies in the Anglican Archdeaconry of N.W. Europe. The last project was completed early in 2006 with the delivering of the second consignment of hand tools to a vocational school shortly to commence in the Archdeaconry of Luttee in Luweero Diocese. The Luweero Twinning now has Trust status with the formal name of “Stichting Luweero Twinning Trust”. With this status it can operate fiscally and legally as a “good cause” and it is our prayer that this good work will be continued by volunteers from our Christian Community in the form of future projects. Projects undertaken by Luweero Twinning are decided in discussion between the Luweero Twinning and Luweero Diocese. In 2004 it was suggested that we consider a number of larger projects for the future. In discussion the concept of a malaria reduction project evolved and we undertook to try to define such a project. The global definition was discussed with the Ugandan Ministry of Health, Luweero Health Department and a location was identified. The Healthy Vine will be the vehicle within the Luweero Twinning that undertakes larger, longer duration programmes all targeted at improving the general health and wellbeing of communities. The work will be funded by congregations inside the N.W.Diocese of Europe, other Christian congregations, individuals and donor organisations. Where necessary we will partner with other preferably Christian organisations. In the current I-AMP+ programme the Luweero Diocese are playing a very active and supportive role and the Busoga Trust which is a UK Christian Charity is undertaking the provision of water for the first 3 villages in Sekamuli. Earlier this year two Trusts were formed “Luweero Twinning” which will continue with smaller short term single activity projects within The Diocese of Luweero and “The Healthy Vine” that will be responsible for the longer term programmes that will require forming partnerships and also obtain funding from outside the current network of supporting Churches and individuals. The programme has made good progress this year and there are no unresolved problems. A lot has been achieved between April 2007 and now. Difficulties have been encountered but overcome and the overall indications are that the programme will be effective. We must realize that in many respects we are entering the most difficult phase in the first 3 villages. Our start in every village is to provide good quality water and shortly after guide the construction of the first “Model Dwelling”. This part of the programme was behind our target programme. A new programme for completion of all water supply requirements by the end of February 2008 has been agreed with the Water group responsible. The Healthy Vine Trust has taken over the Model Dwelling part of the programme because it was well behind schedule and the sanitary standard too low. The water group seriously underestimated the cost of providing wells. This problem has been increased because of the considerable technical difficulties encountered (shifting sand and hard rock during drilling). We had been unaware of these problems because of the poor reporting. In April we formulated, with the Diocese of Luweero, the setting up of the 3 Village Health Committees (VHC’s) and Community Health Workers (CHW’s) 10 per village. A VHC comprises of individuals who already hold a responsible position. This is a community project and they are responsible to the Village Council for the programmes success. The CHW’s are our facilitators and they will ensure that the villages adopt good sanitary practice and upgrade their homes. They will still use local materials and practice. 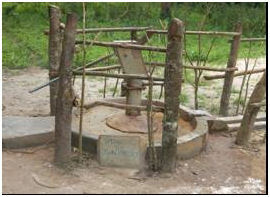 The upgraded homes include proper latrines, washing facilities, a kitchen hut with a chimney, utensil racks, bathing area, hand washing, rubbish pits (one for organic and the other for non-organic rubbish), a well ventilated home and a compound kept swept clean with no shallow surface water in the vicinity. At the same time the CHWs will be monitoring the health of the families they visit with special emphasis on pregnant women and young children. The training of both of these groups has gone very well with a full and enthusiastic attendance for the whole course. The commissioning of the CHW’s was on 28th August with the guest of honour being the Minister of Health for Buganda. Bishop Evans was also in attendance as were representatives form The Luweero Health Dept, Busoga Trust, Local District Councillors, officials from most of the 10 villages in Sekamuli and many villagers. 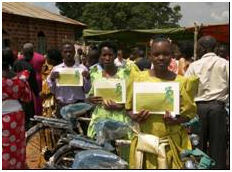 The CHW’s were awarded with a course certificate a bicycle and a pair of Wellington boots. At the start of this programme we felt that our role would be planning, team building, co-ordination and laying down the guidelines for malaria reduction. This has been the case as while the training sessions included water related diseases not enough emphasis was given to the causes and prevention of malaria. We have seen that symptoms and treatment are addressed but prevention virtually ignored also that the possible solutions for water provision are too restricted. We have therefore adopted a more dominant role in the programme. We are now hoping to see good progress with the upgrading of dwellings, distribution of mosquito nets and a wider range of possible methods of providing good quality water. We were very encouraged when the VHC’s made a pledge, to be an example for the communities, in upgrading their homes and have even given themselves a deadline. The commitment of Luweero Diocese and their competence in handling the training has been excellent. We have been developing a relationship with Plan International (Uganda) who is supporting the erection of staff quarters and completion of the clinic in Sekamuli. Plan concentrate on Family Planning, Primary School Education and care for mothers and children who attend the clinic. We have agreed with them not to duplicate activities so Plan Uganda will concentrate on completing the clinic while The Healthy Vine concentrates on the grass roots level covering water, sanitation, community training and agriculture. If funds permit we may provide equipment for the clinic and eventually begin an adult literacy class as illiteracy is quite high among the community. This will be very challenging both in Sekamuli and Europe. In Sekamuli more and more of the success of the programme will be in the hands of the community. They are very enthusiastic but also are a very poor community that has the priority of living from day to day. Our aim is to stay in very close touch until they have seen and felt the considerable benefits in health and economics that this programme will bring. To date we operate by visiting and when present borrowing local transport, accommodation and storage. It is very clear that far more effective progress can be made by a permanent presence and we would also form a better link with local partners. During 2008 we will locate ourselves in Luweero. This will require funding and a more intensive wider search for funding is commencing shortly. Can be a traditional dwelling constructed from mud, straw with a thatched roof of a basic brick building with a corrugated steel roof. The bricks are from local clay and generally baked by the family or in the community. Is normally a mud and straw building with a thatched roof (but can be brick). The clay stove uses wood as a fuel. It uses 30% of the woof in an open cooking fire and with the external chimney there is no carcinogenesis smoke in the kitchen. Wooden racks for cooking utensils keeping them off the ground and clean. A (10 meters + deep) covered pit latrine with hard standing. A latrine this deep will remain in service for many years, there is no odour and the hard standing should be a concrete slab that can be cleaned with water on a regular basis. There is a small cover to stop flies. A simple but effective device that when used can reduce the transmission of disease. An enclosed personal washing area. This should also have hard standing and an effective soak away. It ensures that the family members can perform their ablutions in privacy. No surface water should be left after bathing so a soak away is necessary. A compound for animals kept close to the home. The compound should be strong and kept clean. Large enough for the animal to have exercise, not muddy and a shelter for the bad weather. The compound needs to be strong enough to contain the animal but also provide protection from other animals and thieves. A pit for inorganic rubbish. Rubbish lying around the compound provides a hiding place for mosquitoes during the daylight hours. Rubbish can also be a source of smell and for children disease or injury risk. Organic rubbish can be composted, reducing volume, smell and providing an effective soil conditioner. Some plants and trees have leaves that hold water; these can also be mosquito breeding places. The banana which is grown everywhere in Uganda is a prime example. These should be planted well away from the living area. There are shrubs that discourage mosquitoes some of which have properties that can be used as a natural remedy for malaria. When the model dwelling is complete sufficient nets for the whole family are issued. 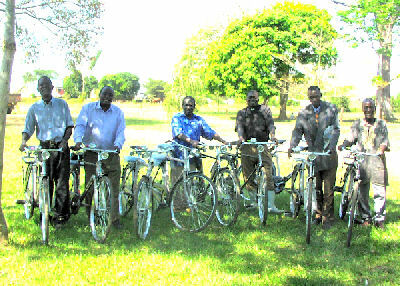 Sekamuli Parish comprises of 10 villages, 3 of these villages were selected for the pilot phase which is scheduled to complete in the spring of 2008. The project is undertaken on behalf of the Anglican Diocese of Luweero with some of its members playing keys roles in the programmes execution. Our aim for the pilot phase was to introduce the concept of malaria reduction by prevention rather than cure. Since to date there is no cost effective prevention that can be used long term we adopted a public health approach which aims to remove the vector for malaria, which is the mosquito. The mosquito needs shallow stagnant water to breed, is active throughout the night but mainly at dawn and dusk and like to hide in dark places during the day. Community involvement from day one is essential to the durability of this programme. Virtually all the skills and manpower exist within the communities. I-AMP+ bring the necessary expertise by utilising its own skills and involving specialist parties. It defines the requirements, sets the standards, plans, coordinates and arranges for the supply of materials not locally available. To be effective as possible it maintains the communication and liaison with other parties such as the Ugandan Ministry of Health, Luweero Health Dept and other NGO’s working in the area. It is with the community that we start the project. Usually a communal meeting is arranged when we commence in a village, that is followed within the next few days with a visit to between 20% and 30% of the families. The visits gauge not only the extent of malaria but other sicknesses and problems encountered. We are also active with other programmes in the parish such as dental care with the mothers and in the schools and school building or improvements. The first step is to encourage an approach by the village committee for provision of potable water. 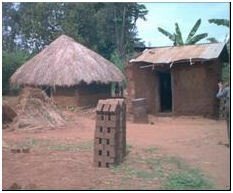 This is constructed by the villagers under specialist guidance from one of our partners. Through them we supply any materials not available locally. We then commence with one model dwelling. A model dwelling is a family compound that includes the following. – Satisfactory sleeping accommodation for the whole family. – A (10 meter deep) covered pit latrine with hard standing. – An enclosed personal washing area. – A pit for inorganic rubbish. – The compound kept swept clean a minimum of 10 meters from the sleeping area. 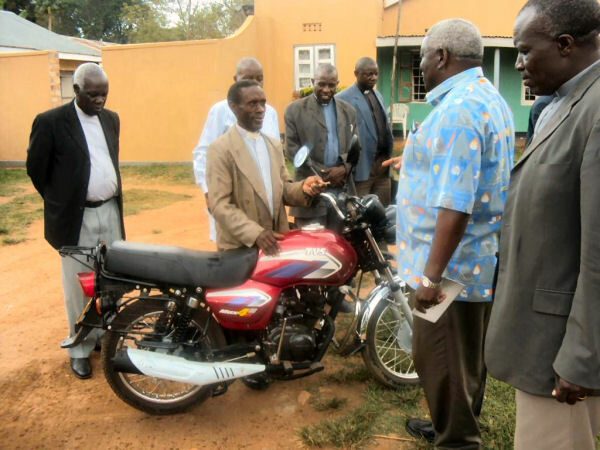 1-It is good News that 2motor bikes were received and handed over to the beneficiaries for God’s ministry in Luweero.The cost was 7,500,000=We manages to get two due to the high and increased prices day by day. 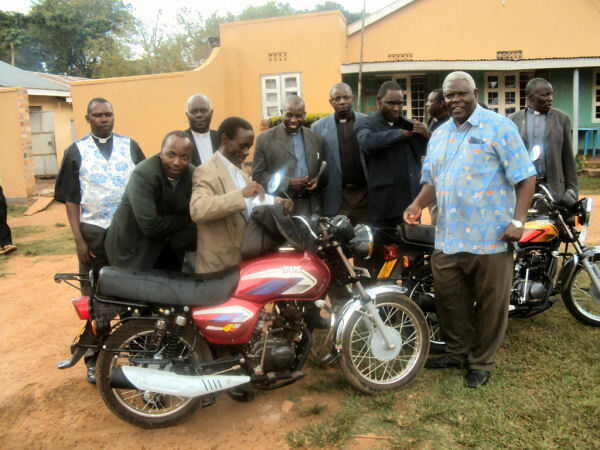 –Ven.Rev.Can.Hezekiah Kalule got a motorbike.He is the Archdeacon of Kiziba-Kiiyusa. 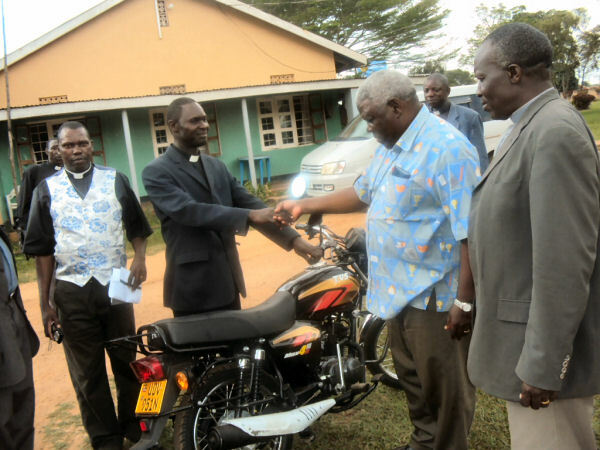 –Rev.Samuel Ssaka of Nabisweera Parish from Nakasongola Archdeaconry also got one.These areas are extremely vast,rural and have scattered homes and Congregations as well.The motor bikes will be used to preach the gospel,Pastoral services and other Mission Out-reaches. 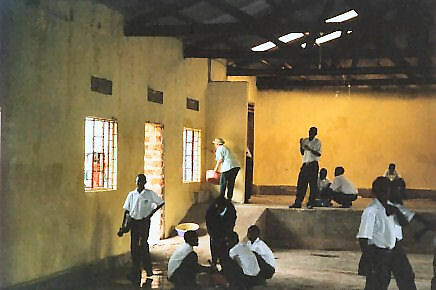 Nakasongola Archdeaconry covers the Political and Administrative district in Uganda. 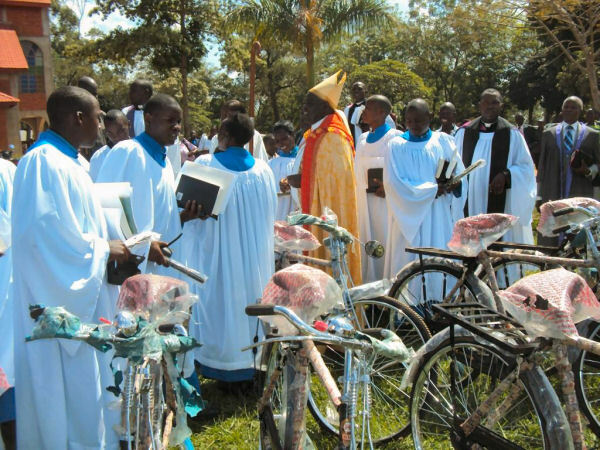 2–Bicycles:25 Bicycles were bought for ministry at a cost of 6,800,000=.Most of these were taken to Nakasongola.The Lay readers are the beneficiaries in this transport project. It was done during Ordination Priesting and Commissioning.It was done due to the high need for such servants who serve under difficult conditions as regards transport means. 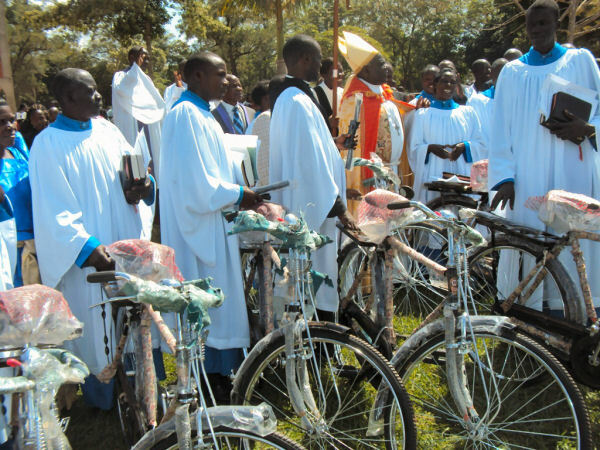 We saw it important that immediately after commissioning they were given bicycles. TreePlanting was given 515,000=although the work still needs more support.But we thank God for His Mighty blessings as regards what we have received from you.